From the first day of CDT450, I have been pondering possible implementation of the theories and technologies that we’ve explored together. The iPad is the most stable tablet on the market. I have been able to increase efficiency in my workflow and decrease the mountain of things that I would normally bring with me. Check out some of my other reflections for the specifics on my favourite features. iPads for every student may not be immediately feasible. In the meantime: I will work to implement cross platform apps that allow us to get by with devices other than those sold at the apple store. Slack, Evernote, Google Apps, Basic video/audio recording are here for us immediately. 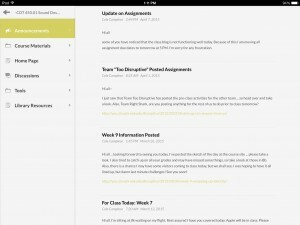 Things that I’d like to try with students, next semester: delivering a presentation via Stre.am, group presentation outlines and research organization via Evernote, eliminating the need to be in the same room while building presentations via Google Slides, and having group readings/text accessibility via the Kindle app. I am TA’ing a theater history course next semester, so I’m going to pitch these ideas to the professor running the course. He’s been telling everyone to get iPads for ages, so I’m sure that he would be very excited to try new things in class. Using the iPad this semester was interesting. I already had owned Android and iOS phones, but this is the first tablet I’d used for a long period of time. Having the extra screen real estate on a mobile device was nice, although I realized that for the work I do the best device is a MacBook and that a phone is more convenient for most mobile use. The one area where a tablet seems most useful is for reading articles and eBooks, which makes it an attractive device for students. On this I’m a bit torn because it’d certainly be better than using multiple textbooks, however carrying three separate devices with me seems strange. This is probably an irrational aversion though; I’m sure I could get used to the idea of having a device in my pocket, two in my bag, and soon maybe even one on my wrist. The biggest conclusion I’ve reached at this point is that buying stock in Apple is probably a good idea. Final Post – iPad, etc. Throughout this course, the iPad was extremely helpful in exploring different aspects of the Disruptive Trinity of Community – Identity – Design. By using apps like Pop and plugging in to Gdrive our group communicated continually with a purpose. Since we had specific objectives to achieve, and we were required to address specific issues related to readings and topics introduced in class, our team acted as “Community of Practice,” as far as I understood Wenger’s description of this term. 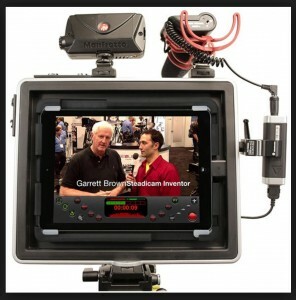 The iPad served us not only as a tool to connect and collaborate; I came to conceive of this mobile device as a “global broadcasting tool” which facilitates my interest in communicating to others about my interests, creations, research, and exploration of myself, my community, and my miniuniverse. Thanks to recent experiments with prototyping tool called POP, I can experiment with a number of different app ideas that I have, exploring workflow and practical aspects of how objects interact on a touch screen. This practical perspective on app development and has expanded my understanding of the options that are available through mobile technology to communicate and interact with people using digital mobile tools. I can say that this has been one of the most remarkable class experiences I’ve had and I am very sad to see it coming to an end. When I signed up for this class I really had no idea what the experience was going to be. I was looking for another class to take that would relate to my other studies but hadn’t made up my mind. When I received an email with the link to this blog, I was intrigued by the type of experimental atmosphere that was alluded to in the course information. As someone who started out skeptical of the positive “disruptions” that technology can have on the classroom, I can say that my view has completely changed. I now see possibilities for communities to form, identities to emerge and be expressed all within well designed environments(both physical and virtual space). The iPad that served as the featured technology this semester created an interesting platform for exploring community, identity and design. The way this course was structured allowed me to investigate how I could benefit from the device. I can now say I do 90 percent of my work on the iPad. Though I still retreat to my laptop for adobe programs, I discovered many apps that could take over this work for small scale projects and I was very happy with the outcome. I recently started using a new note taking app that allows me to highlight and write on any pdf which has been a great find. I have been working with Mindly to map tasks and help me manage work. There are certainly many distractions available with the iPad but turning off notifications can greatly reduce them. It has also helped me manage my emails much more efficiently and I use it for most of my communications. I also used it for lesson planning and presenting material. There is much to say about the class experience but I would just like to thank everyone for the great journey and hope that “future people” get to enjoy it as much as I did. Recently, inspired by Jay, I’ve been looking into sending MIDI between different apps on the iPad. One promising way is using Inter-app Audio, which was introduced in iOS 7. A lot of apps support it, including GarageBand and Tabletop. There’s also an app called MidiBridge that lets you route MIDI to and from apps that support it. This might be more promising because it seems like more apps can use it. If I were to write an app that supported MIDI thought I’d probably look to support Inter-app Audio too since MidiBridge costs $8.99 so that’d be a barrier for people. The iPad has become necessary to my workflow. Its portability and functionality allow it to be the Swiss Army knife of productivity. It’s a browser, text editor, presentation maker, audio and video playback device, camera, microphone, and communicator. Although I have few apps installed on the iPad, it has become sluggish and unresponsive when I have one chrome tab open for the purposes of writing these blog posts. I will type on the keyboard; the keys don’t change color, to indicate that they have been touched, until a second later. 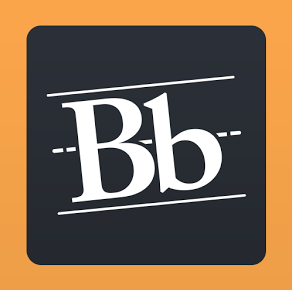 It’s made typing blog posts more than annoying, but all other text input has been less frequently sluggish– I can manage with few instances, but nothing as laden with issues as using the blog and the iPad. I actively dislike not being able to download files and look for them in a specific location on the device, with a file browser– as easily as you can with an android device. I needed to download a pdf from Google drive and upload it to a web application, and I couldn’t. I was only permitted to upload photos, so I took a screenshot and uploaded that. I was left feeling less than satisfied. Regarding operations on large bodies of text: I find it difficult to move the cursor to the correct location in the text. Text selection also becomes an issue. When copying text from Gmail to Evernote, it is difficult to avoid pasting unwanted content, like the gmail layout and the column of emails/folders. I accidentally destroyed a huge assignment by attempting to paste a large selection of an email into the Evernote. The pasted selection sat directly over the typed text; it took me hours to try and salvage what was no longer visible. Aside from web content / text operations that don’t play well with the iPad, all other issues are too infrequent and minute to be worth mentioning here. This week I discovered new ways to use the iPad to improve my productivity. Last Thursday, I helped set up and assist with SBU-TV’s Film festival as an intern. Part of my duties that night involved checking people in with their names and ID numbers. In order to speed up the process, I used my iPad to set up a spreadsheet using Google Sheets while another intern used a laptop to open up the same Google spreadsheet. I was able to have people sign in with their name and ID number and type it themselves using the iPad which made the process a lot faster. It was convenient to have both a laptop and an iPad and be able to have people sign in on both. Google Drive and Docs have been a lifesaver this semester when I’m not able to physically meet up with the other interns or group members in person. Being able to work in Google Docs and have each group member highlight their text with a chosen color has greatly helped to organize notes and blog post ideas all in one place. 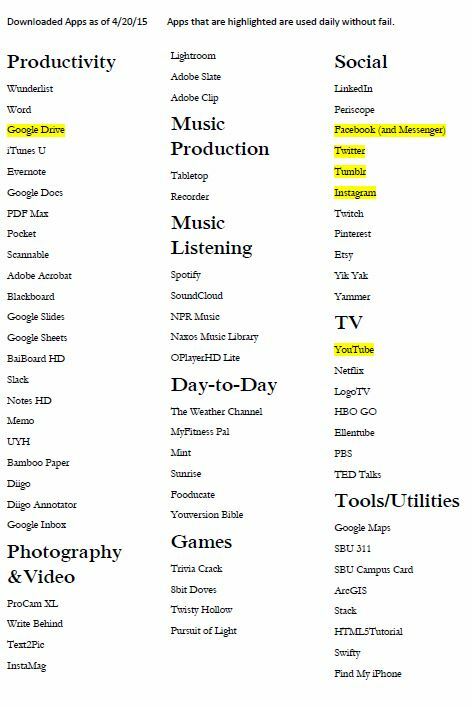 Before the iPad, I rarely made use of Google Drive and had never used Google Docs/hangouts/sheets/slides in such a productive and fast manner. 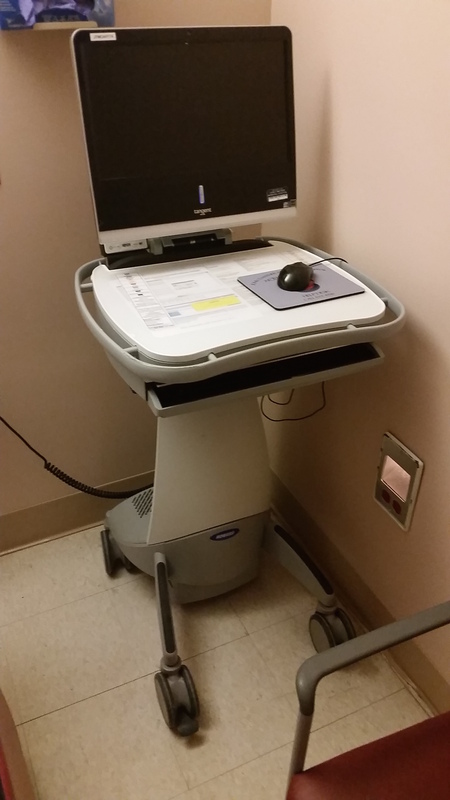 In the theme of design, this week I had to be a companion at the hospital. While I was there, I saw nurses scooting around computers on wheels. The entire setup must cost thousands; big frames, bumpers, wiring, batteries, monitor cradle, etc. The nurse goes from room to room asking patients a series of questions before surgery, and she clicks the appropriate boxes. Being in the field of IT, this interests me, and now, having been exposed to an iPad, I couldn’t help but thinking, how much easier would it be for this nurse to carry an iPad mini on her pocket. The same software could be setup as an iOS app. A fraction of the cost, and a simpler tool to carry. One of the main ways my use of the iPad has evolved thanks to CDT 450 is that my mind is beginning to develop a deeper understanding of the iPad as a MOBILE GLOBAL BROADCASTING TOOL, and the implications for education in general. I can read, take notes, sketch, record video, audio, research, etc. I’ve been doing that for years – But now I’m thinking more about how the iPad can help me to communicate and share my creations, ideas, and discoveries with a global audience – especially when I create something compelling enough to grab and maintain people’s attention. For me some of my most productive learning comes through interacting with other students and experts. I know that my understanding is increased when I am required to create something related to course material and present it, or creatively share it online. As I mentioned above, I’m learning new ways to do this throughout my learning experience, from collaborating online, to presenting to a group. After almost a full semester of occupying the iPad, I don’t know how I am going to live without this thing. All my assignments and a majority of my internet browsing are done using the iPad. 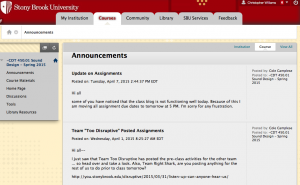 Stony brook University uses a website called Blackboard to distribute assignments, post grades and weekly reminders, and have the students interact with one another. I navigate blackboard exclusively form my iPad. The layout is nicer. The design is nicer. 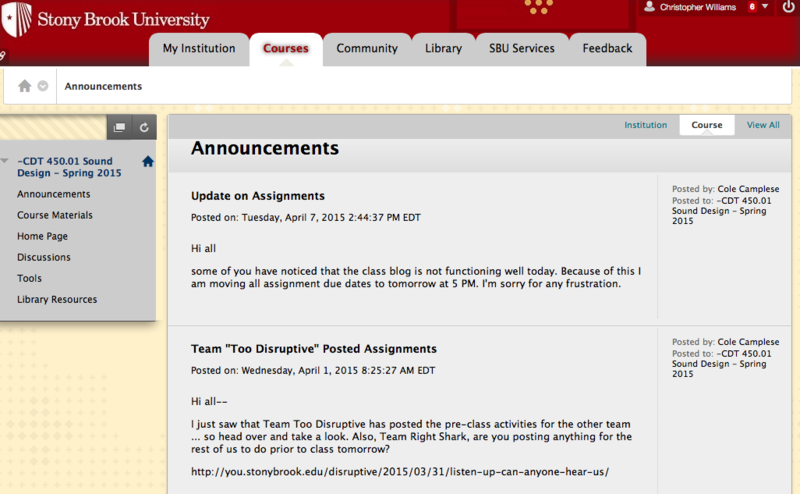 Everything is nicer on the app end of Blackboard. The main difference between the two is the active panel the app version has. It is easy to navigate the different tabs as well as see exactly where you are. It’s been a while since I posted an update on what apps I currently have on my iPad. I’ve definitely increased the number of them that I use. Only the highlighted ones are used without fail every day, but I will definitely say that I still use most of them on a weekly if not every other day basis. I have now used the iPad for about three months, and have finally gotten used to not having a keyboard. Granted, I could never imagine writing a paper without a dedicated one. Other than that, I have noticed that I am much more productive throughout the day–I always have access to materials and tools for each of my classes. I still want a back button. You think I’m joking, but I’m not. There are so many apps that you cannot simply go back one step; you must completely start over. P.S. I assure you that the game “8bit Doves” says exactly that. Image compression is a bit dirty.. Since installing and implementing slack, I’ve been looking for an integratabtle task management extension for slack. I want to be able to nest tasks under larger tasks and have progress reporting and a visual representation of statistics related to the progress/users. This would serve anyone who wants the ability to digitize delegation.